Countless diets, cleanses, and thirty-day challenges are geared to help people lose weight, heal their digestion, and have more energy. Yet these temporary protocols fall short when it comes to true transformation. Nutritionist Carly Pollack lived a vicious cycle of weight ups and downs until trial and error, and over a decade of formal study in health and healing, led her to the insights she has since shared with thousands. 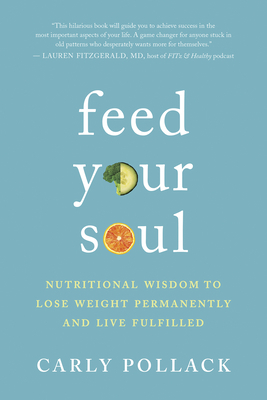 In Feed Your Soul, she presents her unique understanding of body science, brain wiring, and spiritual principles to facilitate real, lasting change. Carly helps you reframe your thinking to, for example, see comfort foods as the numbing toxins they truly are and focus on long-term goals rather than immediate gratification. This no-nonsense guide will show you how feeding your soul can change your life, your health, and your body. Carly Pollack is the founder of Nutritional Wisdom, a thriving private practice based in Austin, Texas. A certified clinical nutritionist with a master's degree in holistic nutrition, Carly has been awarded Best Nutritionist in Austin five years running and has helped more than fifteen thousand people achieve their health and happiness goals.